Tokyo: Carlos Ghosn lashed out at Nissan Motor Co’s top ranks for playing “a very dirty game” by orchestrating his arrests in Japan and his ouster from its global alliance with Renault SA and Mitsubishi Motors Corp. Speaking in a video recorded before he was detained again last week, the former chairman of the three automakers said some Nissan executives conspired to put him in jail instead of focusing on fixing the company’s deteriorating performance. 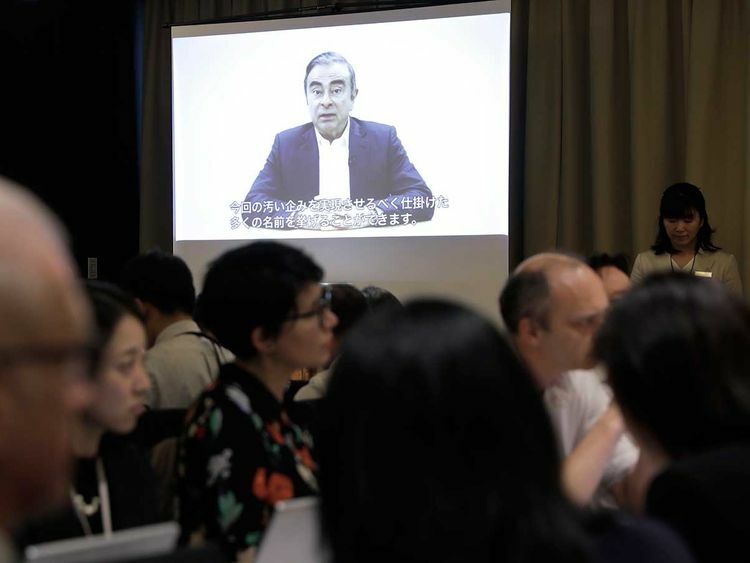 “If you are listening to me on this video, it means I was not able to make the press conference I scheduled for April 11,” Ghosn, who repeated his claim of innocence, said in a video clip lasting almost eight minutes. Although he appeared thinner and greyer in a dark suit jacket and white shirt, Ghosn exuded the confidence and assertiveness that vaulted him to the top ranks of the global auto industry. Until now, he used statements and a few interviews to proclaim his innocence and say there was a conspiracy against him. Speaking straight into the camera this time with his hands clasped, Ghosn’s invective against some of Nissan’s top executives was the most intense anger he’s shown since his first arrest in November. Ghosn originally mentioned specific people in the video, but his attorney said they were edited out because of the sensitive nature of Ghosn’s current position. The cut was evident as the video played. Nicholas Maxfield, a spokesman for Yokohama-based Nissan, declined to comment directly on the video. “The sole cause of this chain of events is the misconduct led by Ghosn,” he said in an email. Ghosn was arrested again at his Tokyo apartment on April 4, cutting short the brief freedom he enjoyed since his March 6 release on bail. His prospects for coming back out appear to be worsening; prosecutors said he used company money funnelled through an intermediary for personal purposes, the most serious charges yet against him. Ghosn will remain jailed until at least April 14, the Tokyo District Court said last week. Renault and Nissan uncovered payments in the Middle East made under Ghosn that allegedly went toward corporate jets, a yacht and his son’s start-up, leading the French carmaker to alert authorities about potential wrongdoing, people familiar with the matter have said. Prison could make it harder for Ghosn to prepare for his trial on multiple charges of financial misconduct. Ghosn, who was first arrested on November 19 and jailed for more than 100 days, has vigorously denied other accusations of transferring personal trading losses to Nissan and under-reporting his income. His trial probably won’t start for months. Jean-Yves Le Borgne, the former chairman’s lawyer in France, said he should be brought to that country for trial because Ghosn — a French citizen — is the victim of a conspiracy by people at Nissan who rejected his plan for closer ties with Renault. When Ghosn was arrested the first time, the auto alliance was shaken to its core. Since then, the companies adopted a new governance structure designed for smoother and more equitable decision-making. Ghosn joined the Japanese automaker in 1999 when Renault took a stake in Nissan, which was suffering under massive debt, heavy losses and a badly damaged brand. Known as a savage cost-cutter, he became a star executive in the country, with manga comic books feting his turnaround of the struggling automaker. Although Nissan recovered and eventually deepened the alliance by taking a reciprocal stake in Renault, it started stumbling again in 2017 with the recall of 1.2 million vehicles in Japan and a drop in sales. “The performance of Nissan is not good,” Ghosn said, citing recent profit warnings. Despite his arrest by Japanese authorities, detention and vilification by some local media outlets, Ghosn said he still has a warm spot for the country and company that turned him into a global business celebrity. “I love Japan, and I love Nissan,” he said in the video.